According to a joint report by Bruegel and the Economics Department of the European Investment Bank, decarbonisation is not necessarily detrimental to growth if the policy mix is well adapted to the issue. Climate policy, like all polices, is about making choices. Taking an economic perspective, the report addresses two major choices of European decarbonisation policies. At the highest level, a decision has to be made whether climate change is best dealt with by reducing carbon emissions into the atmosphere (mitigation), or by investing into assets that allow people to better cope with the consequences of global warming (adaptation). Then, the individual policies to curb emissions and incentivize adaptation investments have to be selected. Underlying these choices is the question of the economic impact of climate policies. Choosing decarbonisation is harder if it is connected with forgoing economic growth. Hence, it is important to understand whether economic growth and decarbonisation can go hand in hand, or if there are choices to be made. The report contributes to all three discussions. It is obvious that both mitigation and adaptation are necessary. However, both policies compete for resources (i.e. on which do we spend the proverbial “last Euro”) while they are to some degree interchangeable (e.g. if there is less climate change thanks to mitigation efforts we do not need higher dykes). There is no self-contained optimal balance between mitigation and adaptation. The balance shifts more towards mitigation if we expect high damages through climate change, and if we care a lot about the welfare of future generations. If we consider the possibility of catastrophic climate change, then large and early mitigation is a “must”. 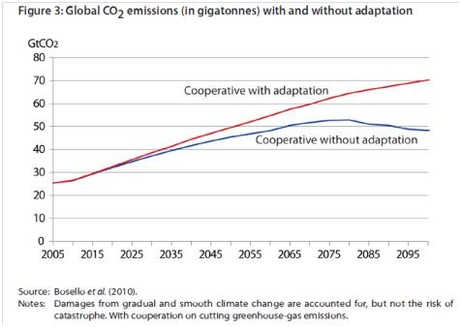 On the other hand, the balance shifts more towards adaptation if international commitments are absent – as unilateral adaptation is possible, while unilateral mitigation quickly becomes very expensive. As such, European climate policy has to be flexible with respect to the outcome of international negotiations as well as updates in the evaluation of climate change (tail-)risks. For a variety of reasons (e.g. market and behavioral failures), markets alone cannot deliver the socially optimal climate action. Hence, a wide portfolio of policies have been developed to incentivize actors to conduct optimal decarbonisation/adaptation practices. However, identifying the impediments to optimal action, and the policies to remove them is a complex task. Against this background, the report develops and applies a conceptual framework for analysing why there might be too little climate investment and how to boost it. This framework proves extremely practical in filtering out redundant or inappropriate policies. Moreover, it provides a valuable tool for coordinating direct climate policy measures with other policies (e.g. support for green research and development), and in this context, it cautions against attempts at trying to kill too many birds with one stone, or using too many stones for one bird. Another key finding is that good climate policy is fiscally neutral, if not benign – as in the case of carbon pricing. The opposite holds as well; poor policies often impose a fiscal burden that most good policies avoid. The good news, then, is that there is no conflict between well targeted climate policy and fiscal consolidation. Decarbonisation policies serve the primary goal of mitigating climate change. In the last decade(s), extensive literature has emerged that suggests that decarbonisation policies might – so to speak as a side benefit – also stimulate innovation and growth. In the report, we argue that the growth impact of decarbonisation policies depend on whether they improve overall economic policies. Decarbonisation policies can be growth friendly if they resolve existing policy or market failures that impede growth. 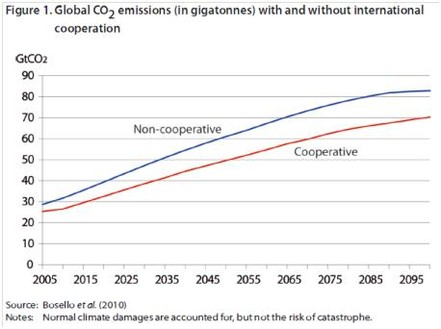 Potential policy or market failures that might be alleviated by smart decarbonisation policies include: cyclical unemployment, growth unfriendly tax structures, unfavourable terms-of-trade, insufficient and ill-targeted innovation, insufficient aggregate investment, and inadequate development policy. However, current European decarbonisation policies are far from efficient – thereby leaving extant growth potential untapped. Although unprecedented tools have been developed to combat climate change, these tools have not been deployed in a manner that would achieve the full potential for concurrent green growth. Hereafter, we propose a set of policies to make European decarbonisation policies more growth-friendly. First, we highlight that a long-term challenge requires a credible long-term framework. This implies stepping-up the role of the European emission trading system, and reducing the micro-management of decarbonisation activities. In this context, we suggest that public bodies grant (put) options on the future carbon price (to investors in low carbon technologies), in order to hedge long-term investments in low-carbon technologies against the (largely) political risk of a collapsing emission trading system. Second, an open and transparent model for directing public support to low-carbon technologies should be established to inform policymakers about the complex effects of technology-support. This would help to spend the billions of Euros allotted for this purpose better; for example: reduce the risk of picking losers, give industry clearer foresight, and allow an ex-post evaluation of what went wrong if things do not unfold as planned. Third, support for deploying renewables and financing energy infrastructure investments, should be organized at the European level. Apart from the classic efficiency argument, a claim can be made that this could help in shifting energy sector projects to countries that are currently in need of investments. In the end, European political piloting is necessary to deliver the socially optimal climate action – which is ultimately about making good and resilient choices.